READY – SET – HARES & TORTOISES ARE GO!!! 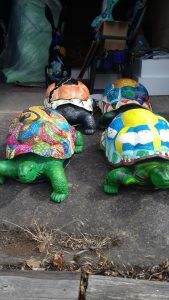 Lichfield Festival Hare and Tortoise Trail begins! “Ready…..set…..GO!” Our Hare and Tortoise models went racing out of their hiding place to their City-centre venue hosts today. They will be available to see around the City every day until 15th July, when they make their way to new homes through our charity auction. Don’t forget to tweet @lichfieldfest with your photos along the trail and let us know whether you are part of #TeamHare or #TeamTortoise!